Coco may be the youngest of the five Tanberry girls, but she can be as tough as big sister Honey and as determined as either of the twins, Summer and Skye. Coco is always trying to save someone, whether it's the giant panda, a bullied boy or her favourite pony. If only Lawrie, the moodiest guy in the school, would stop getting in her way, things would be fine. But has Coco bitten off more than she can chew this time? After reading the other books in The Chocolate Box Girls series, I was unbelievably excited to read this one! Coco is the youngest Tanberry sister, and finds that people often don't take her seriously. She is kind, caring and passionate about saving endangered animals and can usually be found doing cake sales at her school and painting big banners to raise money. She is such a sweet, refreshing character - Coco is determined to save the world, and she's become one of my favourite female characters of all time. She's not obsessed with boys and make-up, she's just proud to be who she is, which is also a great message to be sending out to readers. This is a nice light-hearted read and a good distraction break from revision! It was fun to read and I enjoyed reading about Coco's adventures. Coco Caramel is a sweet story (excuse the pun...) with a sprinkling of romance so I think older readers would enjoy this, too. I really liked the character Lawrie. I didn't like him at first, because I suppose I judged him without really knowing the character properly - which is one of the morals of this story! Once I knew more about him, I understood why he had acted the way he did, and the chapters he was in were always lovely. This book is perfect for readers aged 9-15. 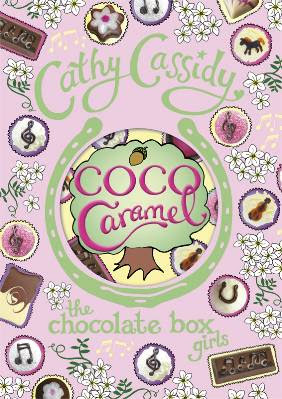 Cathy Cassidy's books are thought to be for a slightly younger audience, but I'm 14 and I still enjoy them! This book is brilliant and I loved every word. A treat for everyone - especially animal lovers! 5/5. ohhh i soo wanna read this! lol all books are distractions from revision! x great review. I think I would need to read with book with a bag of dove chocolate squares or those yummy ghiradelli ones with the caramel inside.